MEF-NF is a concept-level introduction into SDN, NFV, Carrier Ethernet, and Network Orchestration/LSO, within the MEF Professional Certification Framework. For the MEF-NF Detailed Overview click here. 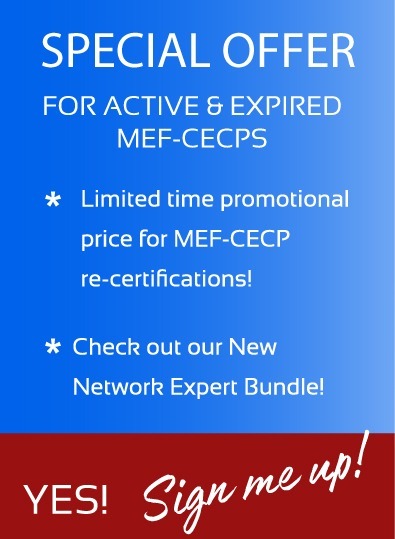 Credential Awarded: MEF Network Foundations Certified Professional (MEF-NF). Valid for three years. Training & Study Available: Several MEF Accredited Training Providers (MEF-ATP’s) are currently offering training and certification exams. Click here for more details. Next Steps: Begin your journey to mastery by learning new technologies that are empowering network transformation, and transform your own career today. You’ll be glad you did!